I'm pretty open-minded when it comes to movies. I can watch a double header of some old Howard Hawks comedies in grainy black-and-white one day, then go see the latest IMAX 3D blockbuster the next. I'm not a purist. Looking back at the way movie theaters have advanced over the years, it's easy to see how much they've improved by making big changes to the format. While some people might have balked when, for example, they changed the aspect ratio from a square to a widescreen rectangle, it was certainly a smart move, giving movie theaters a leg up on television...at least for a while. Over the years, many other improvements have been made to the theatergoing experience. Things like surround sound, 3D, curved screens, and stadium seating have largely made the moviegoing experience better. 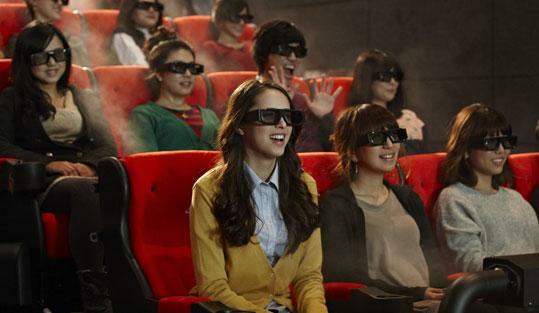 So I was excited to hear that a whole new kind of movie experience was coming to the U.S., in the form of 4DX. If you haven't already, go check out my article on 4DX that we published a few weeks back. You can also check out the 4DX website for more info. The short version is that 4DX is an immersive experience featuring all sorts of environmental effects that are meant to draw you into the film. Recently I was able to attend the first U.S. 4DX showing at Regal L.A. Live Cinemas here in Los Angeles. The film to be screened was Captain America: The Winter Soldier in RealD. I'll confess, it wasn't a film I was dying to see - I was much more interested in the 4DX technology than the umpteenth movie in the Marvel cinematic universe. Although it did seem like the kind of film that would be a good showcase for 4DX (I'm sure they wouldn't have chosen it if it wasn't), so I was looking forward to it. The theater was smaller than I expected, and the screen was a little smaller than I'm used to. The 4DX seats are grouped together in fours, and there is a railing in front of each. On the railing are two nozzles in front of each seat: one for wind/water blasts and one for scents. Behind my head were two tubes on either side of the headrest for puffs of air, while overhead the edges of the ceiling were lined with fans. At my feet was something called "the tickler" - a thin, white, plastic tube that I gathered was intended to move back and forth and tickle my Achilles tendon area. As I was wearing heavy motorcycle boots, this effect was lost on me, but I don't think it was used anyhow. Things got off to an interesting start with a Q&A with a 4DX rep. The best comment came from someone who asked, "Why are the seats so uncomfortable?" And indeed they were. There's a large hump in the back of the seat just below your shoulders that causes you to pitch forward. It also makes it difficult to lean back and rest your head because your eye line is then directed toward the top of the screen. I wondered if the seats were designed for the smaller frames of those in the Asian markets where 4DX has the most theaters. You also can't rest your feet on the railing in front of you because they'll get knocked off when the chair starts shaking. Another person asked during the Q&A why it had taken so long for 4DX to come to America, since there are nearly 300 4DX theaters around the globe. 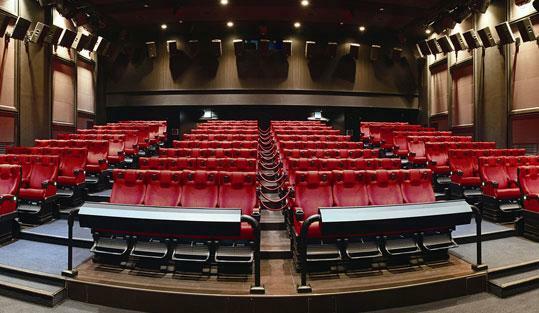 The rep answered that American theater owners were more apprehensive about installing the system and took a "look-see" approach, waiting to see how it turned out in other countries first. I managed to squeeze in a question about how the 4DX effects are encoded. I wanted to know if the filmmakers had any involvement in the process. The rep told me that they have 20 engineers in Korea who work with a lab in L.A., and the motion coding is decided between them. However, the rep claimed that the filmmakers are shown the final product to "quality check" it. Take that as you will. We then watched a demo that featured a car chase with and without 4DX. It mostly utilized the motion-controlled aspect of the technology, with the seats tilting and rising along with the action on the screen. The chairs moved and shook pretty violently, enough so that it made eating or drinking during a chase sequence a dicey affair. Click on over to Page 2 to hear about the Film, the Effects, and whether or not 4DX is the future of cinema . . .